1. b) The PETA Celebrity Cookbook: Delicious Vegetarian Recipes from Your Favorite Stars edited by Ingrid Newkirk1-59056-027-2 For over twenty years, People for the Ethical Treatment of Animals (PETA) has fought for animal rights using creative tactics that have included media stunts, shocking footage, and numerous celebrity endorsements. Many stars have made a commitment to a cruelty-free lifestyle and a compassionate diet. 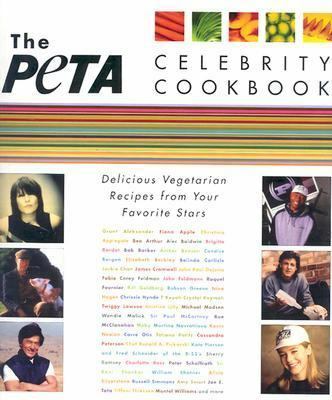 Now PETA has gathered all the fun and simple recipes of its celebrity sponsors into one book. You can enjoy Alicia Silverstone's Artichoke Dip, dig into hip-hop king Russell Simmons' Mama's Mock "Meatloaf," savor Fabio's Risotto, and chow down on Fiona Apple's Sweet and Sour "Cheatmeatballs." The PETA Celebrity Cookbook will help your kitchen become a festival for your appetite and a safe haven for your conscience. Whether you're new at vegetarian cooking or want to add more recipes to your repertoire, this cookbook is for everyone with a stomach and a heart.Newkirk, Ingrid is the author of 'Peta Celebrity Cookbook ' with ISBN 9781590560273 and ISBN 1590560272.